Mark your RSS feeds, favorites and bookmarked pages... Just Braise has moved to a new location. You can now find all the goodies over at www.JustBraise.com. Stay tuned and keep reading. Just Braise is expanding to bigger and bolder things: more giveaways, more random foodie thoughts but still much of the same goodness you have come to expect. Styles are changing and in the next few months expect the pages to evolve c/o my fabulous designer. It's true, I've been posting a lot of sweets lately. It's not because I'm not cooking "real" food, but because the past few weeks have seen me working more than usual. Returning around 8 PM (or later) and cooking while hungry and exhausted just does not put one in the mood to set up lighting for a shot. It also makes for more quick meals-- we're making great progress depleting the frozen soup stocks. Cookies are a relaxing thing to cook for me. They are comforting and delicious and can usually be made fairly quickly. The bonus is that you know they will be delicious. To make myself feel better I called these, "healthy cookies." They are full of almonds and egg whites and have very little flour-- the dessert version of ordering an egg white omelette I'd say. 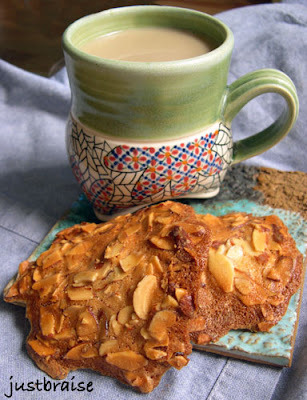 They are delicate yet filling and go nicely with an afternoon tea or coffee. Another plus, they are another winner from The Cook's Book. Tuiles means tile in French and refers to the old curved roof tiles that are layered on homes. Serving Size= 25 large cookies. Active time= about 8 minutes. Inactive time= about 12 hours. 1) Using a rubber spatula, mix the almonds, sugar, vanilla extract or powder, bitter almond extract, and egg whites together in a bowl. 2) Melt the butter gently and, while it is still warm, pour it into the bowl. Mix thoroughly. Cover the bowl with plastic wrap and refrigerate overnight. 3) The next day, sift the flour into the bowl and mix in thoroughly. Place teaspoonfulls of the dough on a nonstick baking sheet, spaced well apart. 4) Preheat the oven to 300F. Flatten each cookie with the back of a large spoon dipped in cold water, then bake for 15-18 minutes. The cookies should be an even golden color with no white in the center. 5) Remove the cookies from the baking sheet using a metal spatula and slide into a sheet of parchment paper. Let cool. Note on Shaped Tuiles: For the traditional roof-tile shape, lift each cookie off the baking sheet with a metal spatula and, while still hot, drape it over a [clean] wine bottle or rolling pin. Let cool and set. I have been quietly slaving away at three jobs lately, oh the pity. But it's true, even D has voiced complaints-- many of which have hidden meaning like, "but there's nothing to eat, another meeting?!" Well, here is the fruition of some of those meetings... Another piece in the Queens Chronicle. If you live in Queens head to your local supermarket (or street corner news box) and pick up a free copy of the Queens Chronicle (Western Queens edition). The piece isone of the feature pieces, about CSAs (Community Supported Agriculture) and how great they are. Queens Chronicle "Planning Ahead for Spring". Also, if you live in Queens (especially Astoria) and a crazy person comes up to you and says, "Hi, are you interested in organic food?" It might be me. Take my brochure, I'm not crazy. If you read this blog you probably want the good food I'm selling anyway-- and sign up for the new Astoria CSA (www.astoriacsa.com)! If you don't know how to cook, we'll hold cooking classes. If you don't want a friend, I don't need to be one. But I'll still like you. Happy Daylight Savings Day if you live in the US in one of those cities that enjoy torturing inhabitants’ internal clocks with bi-yearly time changes. I am embracing bags under the eyes today to push through the pain. Remember to go to your computer maker's homepage and download the necessary plug in to update your operating system. Some of you may have noticed that JustBraise.com appears different than the current Blogspot site you are reading. I am working with a brilliant designer now to modernize, slim down and in general make clear what I can offer you. I am not fully aware of the final vision, but please be patient in the future if either site experiences loading problems or content is missing. I promise it will not last too long. All that being said… brunch! Here in NYC, yesterday blessed us with a hint of Spring. I took a short walk outside to enjoy the mild weather and even went so far as to open a window to let a refreshing breeze pass through (read: to cool the kitchen). Spring weather in NYC reminds me of brunch. Seemingly every New Yorkers' favorite weekend pastime when the weather finally reaches mild temperatures, outdoor seating emerges to take the place. Sidewalks are no longer crowded with bushy jackets but chairs overflowing with revelers of their leisurely 2pm brunching hour. In the suburbs and many other cities, I seem to recall brunch falling around 10 or 11 am. For whatever reason, in New York City, the later you are able to make it to brunch the more it says “I don’t care, I am spending today drinking bloody marys.” For whatever reason, if your time is being spent brunching, your waste of a day is perfectly justified (it also says, “that’s right, I was at the secret after hours location until 6am, pssshhhh.”). One will often find brunch menus extend well past 4pm, overlapping with those early bird dinner specials. In honor of brunch, my slightly early awakening this morning and the change of the season, I present this decadent dish. Soon it will be too warm to enjoy such a luxury— When a hot breakfast is about as appealing as that industrial air conditioner’s exhaust hitting your face on a 90 degree day in what seems to be 100% humidity and the soles of your shoes are melting and the buildings around you create a fabulously effective canyon for retaining heat and you become increasingly bitter at those who were smart enough (or simply have the means and schedule) to flee the City for the duration of the summer and bask in the cool waves of the ocean. No bitterness, I have my bucket garden to tend to. On the other hand, this recipe may allow you to forget the beach and the heat of the summer and bask in the rich joys of winter. Serving Size= 2. Active time= about 8 minutes. Cook time= about 10 minutes. 1) Preheat oven to 400F. In a large sauce pan on medium high heat, melt the butter. Once bubbling, add the spinach, cover and allow to wilt, about 3 minutes. Stir to bring wilted leaves to the top and complete wilting. 2) Add cream, ricotta, parmesan, salt and pepper. Bring just to a simmer, stirring often, about 2 minutes. Add cognac and return to simmer. Taste the broth and add more salt/ pepper if needed. 3) Divide the spinach and cream mixture between two oven safe bowls, reserving about 2 tablespoons of the cream-cognac mixture. Crack an egg over the top and add the remaining cream-cognac sauce. 4) Place the bowls on a cookie sheet for easy removal. 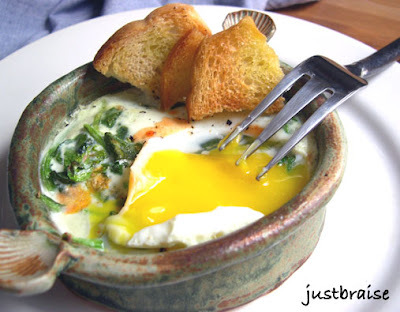 Bake for 10 minutes, or until whites just set for runny yolks, longer for firmer yolks. 5) Serve warm with buttery toasted bread. It is often that when I buy seafood I tend to go a little crazy. The briny smell, the lobsters swimming around, the gracious smiles and even the slight attitude I get when I ask something possibly(?) silly like, “what does that taste like?” Response: “White fish.” Or: “How do I cook this?” Response: “However you like.” Or my recent favorite, “I’m cooking this with capers, do you have capers?” Response: “I don’t even know what that is lady.” It all makes for that authenticity that screams burly fisherman and has me coming back for more than I really need. Okay, so my local fishmonger spends little to no time on a boat actually fishing. More of it is spent “fishing” up in the Bronx at the newly relocated Fulton Fish Market. Still, entering the place is like hanging out with the boys on the docks—on a recent visit I overheard a few stories about the original Woodstock and how the “experience” was “a total trip.” I can guess a few enhancers that would lead to “trippy experiences” that my friendly fisherman might have partaken in. Instead, I kindly smiled and asked for a pound of calamari, cleaned, yes, thank you. And a pound of salmon too please. While the two in combination are not totally exotic, they started to sound really good when I put words like “cajun blackening” and “Thai herb marinated” in front of them, albeit spicey. It also helps to have a winning cookbook (that’s right, The Cook’s Book, where every recipe is clearly laid out with fabulous photography and claims both these recipes as a cinch to make (which is true). Person 1: Prep/ marinate salmon, prep/ marinate calamari. Together: Prepare fish. The calamari takes a mere 3 minutes to cook and the salmon 6. If you start the salmon, get the calamari going, flip the salmon, remove calamari, the salmon is just about done, all remains hot to serve and you’re good to go. Throw in a new favorite quick salad (our own invention) this meal is golden-- or better yet, a deliciously trippy experience. 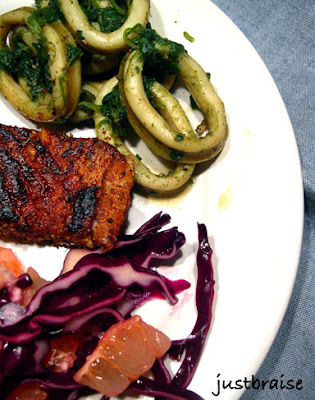 The salmon and calamari recipe are as they appear in The Cook’s Book. When I made this I bought 1 pound of calamari and almost 1 pound of salmon and cut the salmon into 4 fillets. This meal was a satisfying dinner and an even better lunch the next day. It will definitely be made again. The salmon looks daunting, but many of the spices are staples (or should be) or could possibly be left out. Serving Size= 4. Active time= about 20 minutes. Cook time= about 8 minutes. 1) Mix together all spices, herbs and salt. Using half the mixture [per side], rub into both sides of the pieces of salmon and lay them on a tray. Cover and leave at room temperature for up to 30 minutes. Serving Size= 4. Active time= about 8 minutes. Cook time= about 2 minutes. 1) Lightly pound the peppercorns, salt and garlic in a mortar with a pestle until combined. Add the basil and cilantro, and work into a chunky paste [alternately a food processor can be used]. Put the quid into a bowl and coat with the paste. Leave at room temperature for 15 minutes. 2) Heat a wok until smoking. Add half the oil and swirl it around. Add half the squid and cook over high heat for 30 seconds, tossing it a little. Tip the squid into a bowl. Wipe the wok clean, then cook the remaining squid in the same way. 3) Return the first batch of squid to the wok and add the fish sauce and palm sugar. Toss together and cook for 20 seconds longer. Serving Size= 4. Active time= about 8 minutes. 1) Slice the vegetable and fruit. Put everything into a bowl, toss and serve. Okay, so it's a little icier than creamy, but flavor makes up for it. If there is an almond infused chocolate bar out there please tell me. When Hershey's begins to make almond-chocolate syrup for my chocolate milk don't even attempt to hold me back. I made one small milkshake for myself and all D heard was, "Oh gosh." "Gimme. [Taste] Oh... this is so good. Make me one?" 1 part blanched and skinned almonds (you can buy them like this, they are the all white, slightly unappetizing looking ones. 2) Add boiling water, cover and let steep for at least 30 minutes. It is good like this but I added a touch of honey and a dash of pure vanilla extract to spike the senses. I have bought almond milk before and love it, but often find the storebought kinds too sugary. 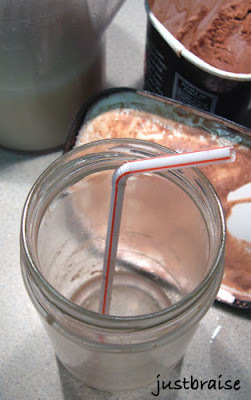 This homemade recipe is so simple and far superior. D and I used this milk in coffee this morning, deliciously nutty. It would be great in oatmeal. But tonight it hit peak flavor mixed with chocolate ice cream. Pure loving decadence. The above photo proves that every living creature loves fresh grown vegetables-- Even better if we can agree to love different parts. There is no time like the present to begin planning your garden for the coming summer. My wee bucket garden (see last year’s progress here) will make a comeback this summer with some much needed reinforcement from the local CSA I’m helping to start up in my neighborhood. I am happy to report that the farm my CSA chapter is pairing with is located in wine country and perhaps with a little convincing, I can get my farmers to set me up with a wine supply! If not, I am happy to visit the farm on strawberry picking days and swing back to the vineyards for some bottles on the way home. For those who are unfamiliar with CSAs, it stands for Community Supported Agriculture and is available in and around most cities. A community gets together and pairs with a local farmer, agreeing to pay the farmer in advance to receive a "share" of produce throughout the growing season. With this system, the already expensive and laborious process of organic farming is ensured to be profitable for the farmer, allowing them to concentrate on farming, not worrying about the possibility of selling land to developers or something else. The greatest benefit is that the local CSA chapter gets to know their farmer while building a community that is often lacking in urban areas: you know where your food is coming from on a more personal level than a green market, you are supporting a local farmer, you're eating healthier, fresher food, etc etc. If there is an excellent season and a bounty, each CSA benefits. The downfall is if there is a drought, flood, etc, you suffer just as much as the farmer. Also, there is less choice than a greenmarket: you get whatever the farmer is growing. I still believe the benefits outweigh the negatives in this age of industrial uncertainty, and besides, fresh food just tastes better. Local Harvest provides additional information on CSAs and how to find one in your area. This summer, because of my CSA, I can concentrate on growing some of my favorite items that my farmers will not be offering me. I still must keep in mind tomato thieves and the more unusual chickenwire thieves (which I now suspect might have been for a Meth lab)— how the imagination wanders when perpetrators lurk nearby. Last year, with some advice from a fellow blogger, I ordered seeds from Baker Creek Heirloom. They have a fabulous variety of basic and more unusual (heirloom) plants. 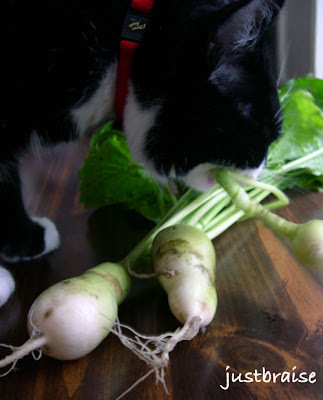 My radish plants did fairly well last season and I will order more of those, though I might try a new variety. Final order report tk in the coming days. When ordering seeds, keep in mind the amount of light your space gets. My outdoor space is fairly shady and I have to make due with this. No worries, there are plenty of plants that do well in low-light conditions and should be mentioned in the plant’s description, my favorite is arugula. Also, don’t forget to check your planting zone and match it up to your seeding times. This also helps when finding plants that will grow in your area. If you live in an urban area and are looking to start your own bucket garden, Texas A&M’s Agriculture Dept offers some pointers with hilariously outdated computer clip art. Another good site I found has great tips for more unusual growing containers (from discarded tires to wading pools and feed sacks). The site really encourages community gardens, though the information can apply to setting up a personal garden in limited spaces. Keep in mind that the site is a bit old and can get a little hard to navigate. The National Gardening Association is another great resource with tons of general information. If you have a large space for a proper garden. I’m jealous-- Go find your own help! (Or use some of the references above.) Get excited for the growing season to come. My mother is an import/exporter of mostly dehydrated herbs and spices, though she is able to supply pretty much whatever her clients need. It is a great connection to have when I need say, a few vanilla beans and receive 15 shipped to me the next week. Or when a client needs a small sample of something and I receive the leftover samples (like a pound of shredded almonds). My mother often does the above for me, but in full disclosure. If she sees a product she thinks I will enjoy, she tells the supplier her daughter has a food blog and should be sent samples to review. Many shoo her away, but every so often, I receive a mystery box of product in the mail. A few months back a very large mystery box arrived. Inside was containers of Paul Dupre Wine Reductions. I received 750 ml bottles of Chablis, Burgundy, Port and Sweet Masala reductions, tons of sample sized packages and even recipe books on how to use them. I keep forgetting I have them so haven’t had the chance to put any to the test. If you would like to receive some samples just let me know and I’ll ship it out. Email me (contact info at left) or provide your email in a comment and I’ll be in touch. It’s first come first serve, but I have about eight sample packets I put together, each contain about 3 samples of the four varieties and recipe books. I just ask that when you do use them, let me know how it goes! More giveaways to come in the future so check back! * Please understand that for this giveaway I can only send within the continental U.S.. Sorry!